I couldn't wait to get stuck into this book - after I'd read the Colors of London book, and having lived in New York, I couldn't stop myself. Also by Donna Dailey, like the London book, I was sucked in and reveled in the sights of this wondrous city. I remember dark and dreary winter days, and I also remember the city coming to life at night when everything lit up and became magical. Ms. Dailey has done a great job with these books and as you page through this one, all seems so familiar, even if you have never been there - you know New York. You can feel its vibrancy through the pages. Stores, restaurants, delis, hot dog stands, people, buildings, bridges, statues, skyscrapers, the art, night scenes, the cars, everything that makes New York the city it is today is beautifully captured here. A brief history about how Manhattan was bought from the Native Americans and how diverse it's since become, and not only in terms of the wide variety of people who live and work there, but also in terms of the neighborhoods, food, and cultures. New York is such an awesome combination of everything and if you can't get to this city, or are intimidated by it (there's an awful lot to see and take in when visiting), then having this gorgeous book will make up for it. I love to really spend time getting into the photographs - there's so much more to see than meets the eye. Well done Ms. Dailey, on both accounts. I can only imagine how gorgeous the Paris and Italy books in this line are. 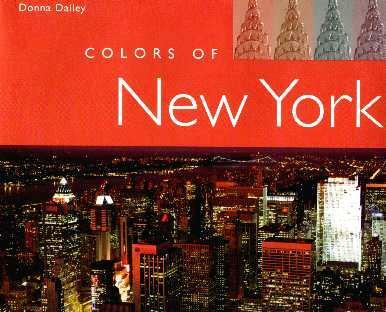 Colors of New York may be purchased and/or ordered through your local bookstore. Conclusion - Another must-have book. You'll look through it often, and that's the mark of a good book.